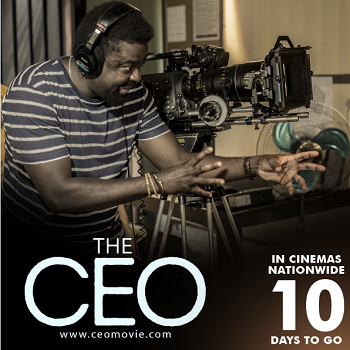 The Cinema premiere for Kunle Afolayan’s latest movie, “The CEO”, comes up in ten days from now; this is coming after a special premiere on June 1, 2016, on-board a flight from Lagos to Paris, a feat no one has achieved before anywhere in the world. “The CEO” is set mainly on a beautiful beach resort on the outskirts of Lagos in Nigeria, “The CEO” is a mystery-thriller surrounding five top executives from across Africa who are dispatched on a 1-week leadership retreat by a multinational telecommunications firm, to determine which one to appoint as the firm’s new CEO. Things go awry when one-by-one the executives are eliminated in sudden death circumstances, and the finger falls on the last two remaining executive as prime suspects.